Aviation causes high levels of climate pollution. Climate protection in aviation is a topic of great social relevance. - causes high levels of climate pollution: not only carbon dioxide, but also nitrogen oxides, water vapour and other greenhouse gases are emitted during flight at altitudes of up to 10,000m above sea level. The effect on the climate of all these gases together is 2-4 times higher than that of CO2 on its own. 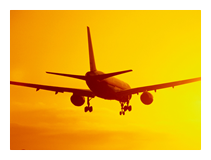 - shows strong growth: aviation is growing faster than any other transport sector. On average, it doubles every 15 years. - benefits from weak points in the law: aviation - as a source of greenhouse gases - is explicitly excluded from the Kyoto Protocol.